何宇纳, 赵文华, 白国银, 房玥晖, 张坚, 杨晓光, 丁钢强. He Yuna, Zhao Wenhua, Bai Guoyin, Fang Yuehui, Zhang Jian, Yang Xiaoguang, Ding Gangqiang. He Yuna, Zhao Wenhua, Bai Guoyin, Fang Yuehui, Zhang Jian, Yang Xiaoguang, Ding Gangqiang. Relationship between meat consumption and metabolic syndrome in adults in China[J]. Chinese Journal of Epidemiology, 2018, 39(7): 892-897. Abstract: Objective To explore the relationship between meat consumption and metabolic syndrome (MS) in Chinese adults aged ≥ 18 years. Methods The data were obtained from 2010-2012 National Nutrition and Health Survey. A total of 34 923 subjects who completed the dietary survey, the physical examination and had the testing results of blood sugar and blood lipid levels were enrolled in this study. MS was defined according to the diagnostic criteria of China Diabetes Society 2013. The prevalence ratios of MS and each form of MS and related 95%CI were calculated after post stratification weight according to the population data (2009) released by the national bureau of statistics. Results The average meat intake among subjects was 94.8 g/d. People who had meat consumption between 100 g/d and 199 g/d had the lowest prevalence of MS, abdominal obesity and hyperglycemia. As the meat consumption increased, the prevalence of MS in men increased. Men who had meat consumption of ≥ 300 g/d had a higher risk of MS than those who had low level of meat consumption, with prevalence ratio equaled to 1.46 (95%CI:1.14~1.87). Similar trend was not observed in women. Conclusion Moderate intake of meat is associated with reduced risk of MS in Chinese adults. Damião R, Castro TG, Cardoso MA, et al. 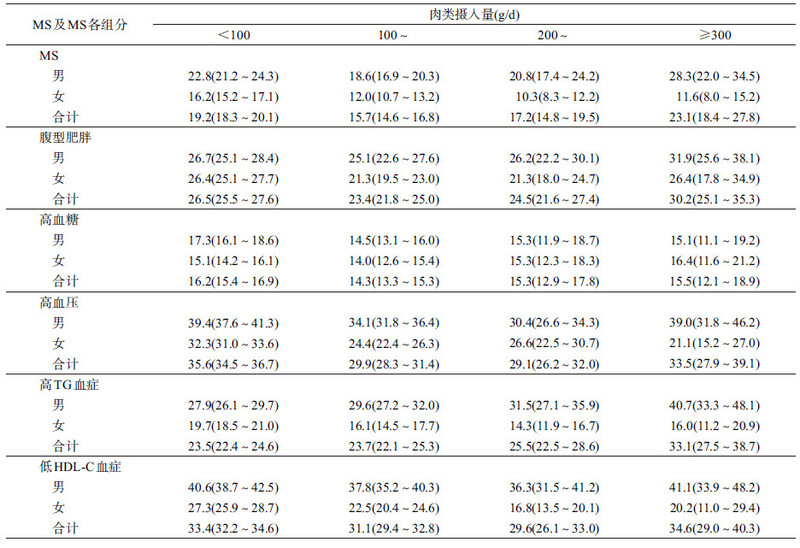 Dietary intakes associated with metabolic syndrome in a cohort of Japanese ancestry[J]. Br J Nutr, 2006, 96(3): 532–538. 胡以松, 翟凤英, 何宇纳, 等. 中国人群代谢综合征与食物摄入的相关性研究[J]. 实用预防医学, 2008, 15(1): 1–8. 陈伟, 蔡建芳, 樊晓红, 等. 北京平谷区18~76岁人口代谢综合征风险与饮食的关系[J]. 中国糖尿病杂志, 2015, 7(2): 89–94. 中华医学会糖尿病学分会. 中国2型糖尿病防治指南(2013年版)[J]. 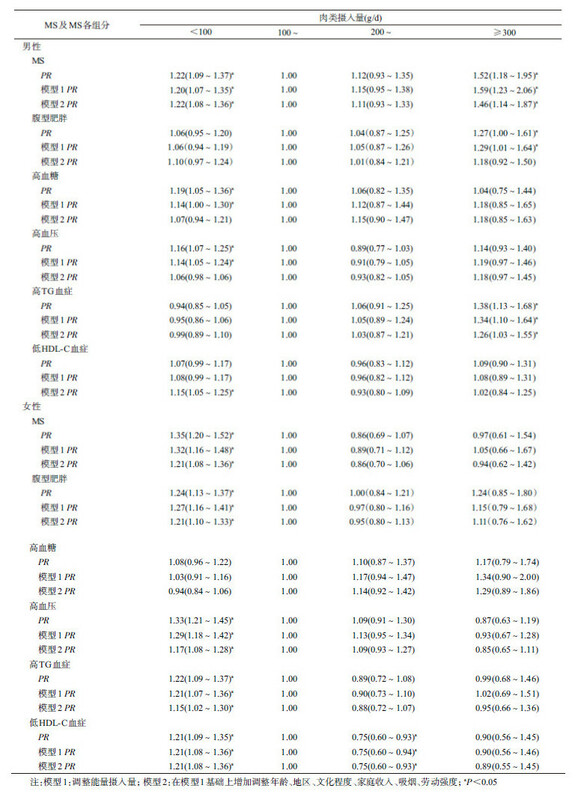 中国糖尿病杂志, 2014, 22(8): 2–42. 杨月欣. 中国食物成分表 2004(第二册)[M]. 北京: 北京大学医学出版社, 2005. Yang YX.China Food Composition 2004(Version 2)[M]. Beijing: Peking University Medical Press, 2005. 杨月欣, 王光亚, 潘兴昌. 中国食物成分表(第一册)[M]. 2版. 北京: 北京大学医学出版社, 2009. 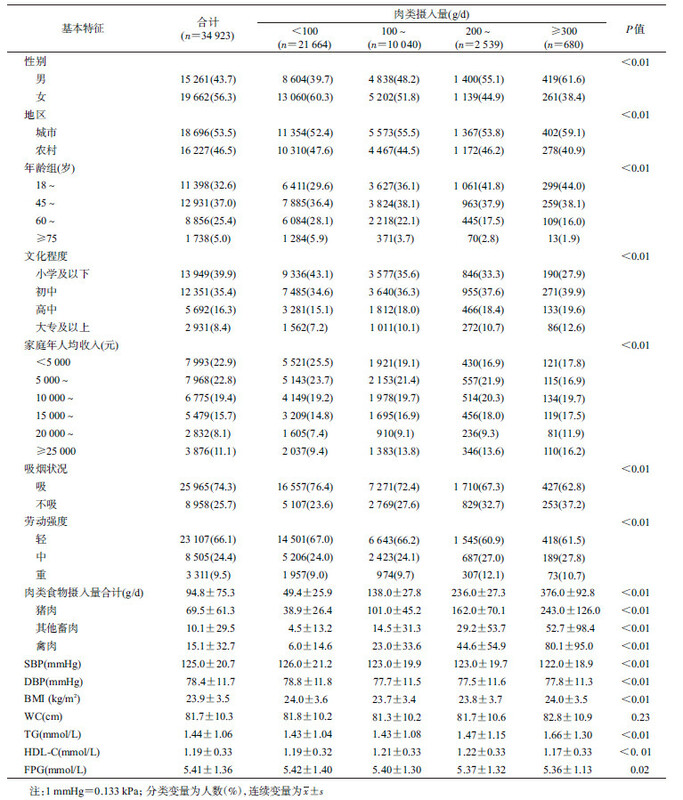 Yang YX, Wang GY, Pan XC.China Food Composition Table (Version 1)[M]. 2nd ed. Beijing: Peking University Medical Press, 2009. Chinese Nutrition Society.The Chinese Dietary Guidelines[M]. Beijing: People's Medical Publishing House, 2016. 邹玉峰, 薛思雯, 徐幸莲, 等. 《膳食指南科学报告》对肉类食品摄入的建议[J]. 中国食物与营养, 2015, 21(10): 5–8. 时景璞, 黄蓓婷, 王海龙, 等. 不同血清铁水平与原发性高血压关系的研究[J]. 中华流行病学杂志, 2006, 27(9): 761–764.